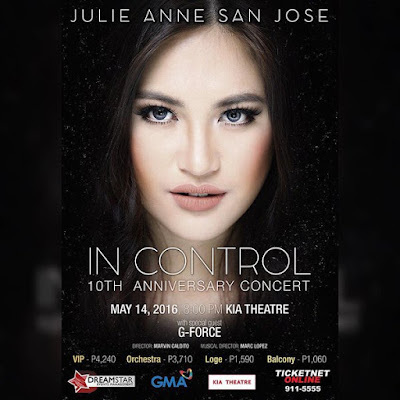 JULIE ANNE SAN JOSE is naturally tense these days as she prepares for her concert, “In Control”, that will be staged at Kia Theatre, Cubao, tonight, May 14. A lot of people notice that she has become sexier and seems to have lost a lot of unwanted pounds. Julie Anne should be emulated by other stars, especially those who shun getting higher education as soon as they start earning money from working as an artista in showbusiness. In her case, she already got a college degree and yet, here she is, now wanting to go on a higher level by taking up her masters. Way to go, Julie Anne!